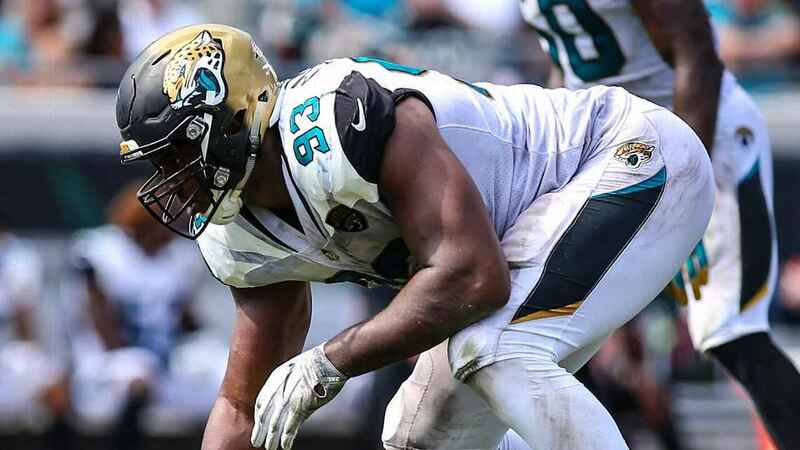 ENGLEWOOD, Colo. – In the almost constant review of the Denver Broncos season that has gone on in the weeks since the 5-11 finish, a name that has popped up more than occasionally as a symbol of how things got to this point is Calais Campbell. Campbell was the Broncos’ big target in free agency last March, a Denver native, no less, who had grown up watching John Elway – the team’s top football decision-maker – win back-to-back Super Bowls at quarterback. And the Broncos lost a bidding war, or chose not to fight, take your pick, when Campbell signed a four-year, $60 million deal with the Jacksonville Jaguars. Campbell, who is exactly the kind of inside presence the Broncos have lacked in the defensive line to help Von Miller in the two playoff misses of the last two seasons, then fair or not became somewhat of a symbol of the Broncos making the safe play when they need more. Campbell, at 31, finished this past season with a career-best 14.5 sacks and was named a first-team All Pro for the first time in his career. And the question, in the numbers-crunching side of decisions that are made, is whether Campbell can keep up that level of play the remainder of the contract as he ventures deeper into his 30s. But in and around the team’s faithful Campbell is the hometown guy the Broncos didn’t go high enough to get. They weren’t the damn-the-torpedoes team that signed Peyton Manning, DeMarcus Ware, Aqib Talib, T.J. Ward and Emmanuel Sanders – all were named to at least one Pro Bowl after signing with the Broncos – in a two-year span on the way to a Super Bowl win. With all of the numbers swirling about what it will take to sign a front-line quarterback in free agency, a player such as Kirk Cousins might command the largest contract ever signed by a quarterback, Elway has yet to publicly declare the Broncos are ready to go all-in for a quarterback in the open market. The Broncos also have the No. 5 pick in the draft so have to sift through how to spend their free-agency dollars in relation to what their plan is with their draft picks, including the earliest the team will pick in the opening round since the Broncos selected Miller No. 2 overall in 2011. But since the free-agency haul of 2014 – that was when Ware, Talib, Ward and Sanders signed with the Broncos – Elway has taken a far more measured approach to the open market. Last March, for example, guard Ron Leary and tackle Menelik Watson were the first players the Broncos reeled in. Part of that was necessary given those contracts had followed Manning’s blockbuster and the Broncos had re-signed their own players such as Demaryius Thomas, Chris Harris Jr., Derek Wolfe and Miller along the way. Miller’s deal was the largest for a defensive player in the league’s history. Now that Sunday’s Super Bowl has effectively put a period on the 2017 season, the Broncos are back on the treadmill with repairs to be made, decisions to make on the money to spend, or not to spend, and one of the most important drafts of Elway’s tenure. All with Elway weighing the issue he addressed both at season’s end and at the Senior Bowl — how much is too much with so much work to be done.